Under Florida law, leaving the scene of a car accident that results in damage to a vehicle or other property, is a criminal offense. Moreover, the responsible driver can be found liable for damages if the accident results in injury or death and the victim (or the victim’s family) brings a personal injury or wrongful death lawsuit. Unfortunately, this hit-and-run prohibition doesn’t always deter drivers from fleeing. Here are three examples of hit-and-run incidents that took place in March 2017. A man was injured by a white BMW SUV that left the scene of the accident. The man was initially unresponsive when emergency officials arrived, he regained consciousness. He was taken to Jackson Memorial Hospital with a broken arm. The accident took place near the intersection of Northwest 37th Avenue and Fourth Street. A black Nissan Sentra struck a pedestrian on Northwest 72nd Avenue, leaving him to die. The victim, 39-year-old David Fernandez, was found lying on the side of the road the next morning. The car that ran him over apparently has extensive damage on its right side. A white Nissan Altima struck a woman in a wheelchair while she was crossing the street early on a Saturday morning (around 2 a.m.). A witness reported that the responsible driver left the scene of the accident, returned to check on the woman’s condition, and then left the scene once more. She was taken Jackson Memorial Hospital, where she was listed in critical condition. The accident took place at Northwest 17th Avenue and Northwest 69th Street. 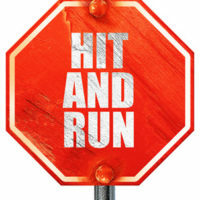 Anyone who has information on hit-and-run incidents should call Miami-Dade Crime Stoppers at 305-471-TIPS (8477). Callers can remain anonymous and might be eligible for a $1,000 reward. What Should You Do If You’re Involved in a Hit-and-Run? If you are involved in a car accident and the other driver leaves the scene, try to take down his or her license plate number (or however much of it that you can). Take note of the make and model of the car, the color and any identifying marks like a dented bumper or a window full of stickers. Report the accident to the police immediately and give them all of the information that you can. Also take note of any witnesses who can corroborate your account or provide additional details. Make sure you also provide an accurate account of the incident to your insurance company and contact an attorney who has experience dealing with hit-and-run accidents, like the personal injury attorneys at The Pendas Law Firm. Once we track down the perpetrator, we can help you prepare an effective personal injury lawsuit. The Pendas Law Firm also represents clients in the Jacksonville, Fort Lauderdale, Fort Myers, Tampa, Orlando, West Palm Beach, Daytona and Bradenton areas.